If you’ve got a heart for history and a needy sweet tooth, we’ve got the perfect recipes for you. 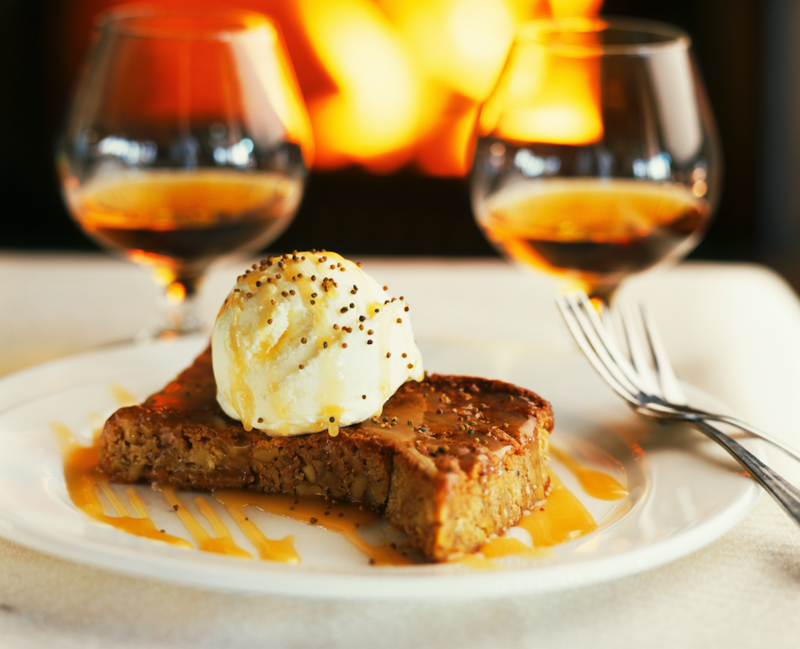 We’ve compiled a few of The Fort’s most popular – and delicious – dessert recipes, including the background on how they came to be on our menu and/or in our cookbook. We serve a lot of ice cream sundaes at The Fort, including one Holly Arnold Kinney, Proprietress of The Fort, created herself at just ten years old. 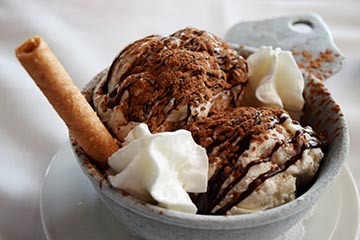 When The Fort first opened its doors, you could purchase a small brick of vanilla ice cream, which was sprinkled with a mixture of Nestlé’s hot cocoa mix, sugar and cinnamon. Holly let the ice cream melt and stirred the dry mixture into the creamy liquid to create her own sauce. Her parents – and the founders of The Fort – thought her creation was so innovative that they put it on the menu, where it has remained in one variation or another to this day. This cake was originally a special treat for birthday and anniversary celebrations at The Fort, but due to popular demand, we were convinced to put in on the menu as an everyday offering. The cake features red chile to honor the ancient Aztec tradition of spiking their chocolate drinks with a little heat. For the cake: Butter two 9-inch round cake pans. Lightly dust the sides of the pans with flour, tapping out the excess and line the bottom with circles of parchment or waxed paper. In a medium saucepan, cook the chile powder in 1 cup of the water over medium heat until simmering. Remove the pan from the heat, stir in the vanilla, and set aside. Using a mixer with a wire whip attachment for best results, combine the flours, sugar, baking soda, salt, and cocoa and beat on low speed until well mixed. Add the softened butter to the dry mixture and beat thoroughly on medium-low speed. The mixture should be a uniform, grainy texture. Raise the speed to medium and gradually add the remaining 1 cup of water and the buttermilk. Add the eggs, one at a time, beating well after each addition. Slowly add the hot water/chile mixture and continue to beat just until well combined; be sure not to overbeat. Pour the mixture equally into the pans and bake for 35 to 40 minutes, or until a toothpick inserted in the center of each layer comes out clean. To cool, set the pans on a wire rack for 15 minutes. Then turn the cakes out onto the rack, remove the paper from the bottom, and immediately invert so that the risen tops don’t flatten. Let the layers cool completely before frosting. For the frosting: Combine the butter and cocoa in a large saucepan and melt over medium heat. Stir in the buttermilk. Add the confectioners’ sugar, a little at a time, stirring with a wire whisk between additions. Stir in the bourbon and vanilla and continue to whisk until the frosting is smooth and glossy. The frosting should stiffen as it cools. When it is still warm, but has reached a spreadable consistency, you can assemble the cake. If necessary, trim the tops of the cakes so that they are level. Place one of the cake layers on a 9-inch round cardboard cake circle. Spread 1 cup of the frosting over the layer. Sprinkle 1 cup of the chopped walnuts, if using, evenly over the frosting. Place the second layer of cake on the frosted base. Use the remaining frosting to cover the top and sides of the cake. Finish the top of the cake by holding the spatula at a slight angle and making several strokes to smooth the top. 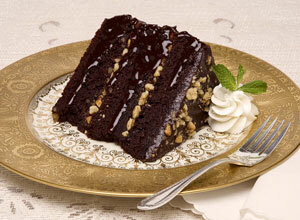 To decorate the cake, press the remaining walnuts onto the lower half of the sides and on top of the cake. This cake is best when made 1 to 2 days before serving as it gives the flavors time to blend. 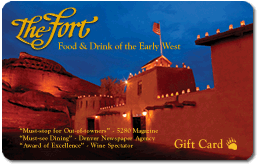 In 1998, Sam’l P. Arnold received a phone call at The Fort from a woman named Vera Dahlquist, who was inquiring about whether or not The Fort would consider hiring an 80-year-old baker. Arnold recalls thinking that Vera likely knew more about baking than the entire team combined and hired her. Vera, who had emigrated from Finland, was a gifted baker, specializing in banana cream pies and fragrant dinner rolls, but her brownies were The Fort’s most popular. The brownies have a chewiness that makes them both a brownie and a candy, and require hand mixing the batter to create this texture. Preheat the oven to 350°F. Grease and line the bottom of a 9 x 13 in. baking pan with parchment paper. In a large bowl, blend together the flour, brown sugar, baking powder and salt. In a small bowl, beat the eggs slightly. Stir in the butter and vanilla. Add the egg mixture to the dry ingredients and blend well. Stir in the nuts and seeds. Spread the batter in the prepared pan. Bake for 25-30 minutes, or until the center can be touched without leaving an indentation. Do not overbake. Once cooled, we suggest serving the brownies with a scoop of vanilla ice cream, a dollop (or two) of whipped cream and caramel drizzle.